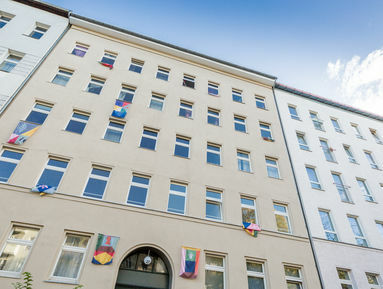 Dating from 1906, this is a typical Berlin Atbau. Solid and dependable, with a bit of shine on the outside and a lot of space and variety inside. Well-proportioned apartments, 65-90m² of living space, well-kept floors, white walls, high ceilings and lots of light; there are countless opportunities for designing and decorating your apartment just how you wish. And with the freshly painted façades and new balconies in the courtyard, this place really does have it all. Covering 65sqm, with a spacious bedroom and living room facing onto the quiet, residential Tegeler Strasse, this apartment is ideal for young couples. The kitchen even has a small, pretty balcony looking out into the open courtyard, perfect for enjoying the sun in the morning as you sip your coffee. The high ceilings, white walls and large windows make the apartment feel even larger, and the bright bathroom, with bathtub, is made for relaxing. Welcome to vibrant Berlin-Wedding, which is still a hidden gem in terms of real estate, despite its clear potential. Sprengelkiez itself is a diverse and creative residential neighbourhood that is continually reinventing itself. Life here is a balancing act between art, sports, nature and relaxation, and there are good public transport connections via Wedding train station. That is, if you even feel the need to leave the neighbourhood.